Q. Is there a biography of Sylvia Vigiletti? I am interested in finding what role she had in the studio art glass movement. Image: Paperweight. Sylvia Vigiletti, maker. CMoG 79.4.138. Kohler, Lucartha. Women Working in Glass. Atglen, PA: Schiffer Pub. Ltd., 2003. This book profiles Vigiletti in her chapter on women glass artists of the 1960s. Zynsky, Toots. "Women Who Helped Pave the Way." The Glass Art Society Journal (2012): 52. In this brief reflection, Zynsky discusses Vigiletti along with other women glass artists who influenced Zynsky's work. Glass Art Society oral history interview with Sylvia B. Vigiletti, 2009 June. Sally Prasch, interviewer. 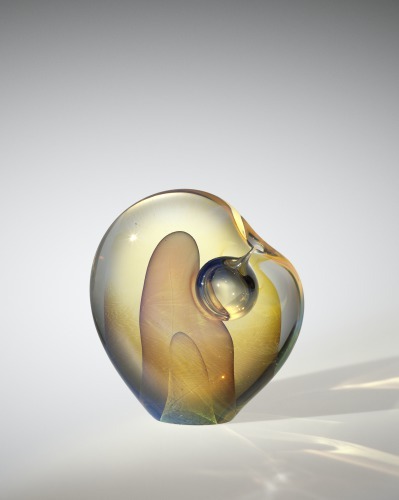 Vigiletti's entry in Who's Who in Contemporary Glass Art. 1st ed. München: Joachim Waldrich, 1993. Himel, Susan, Lambert, Elaine, and Wilde, David. “Mary Filer and Sylvia Vigiletti at the Glass Art Gallery-Two Reviews.” The Leadline 6, no. 2 (Spring 1981): 10-11. "Presentation of Honorary Life Membership Awards to Henry Halem, Joel Philip Myers, and Sylvia Vigiletti." The Glass Art Society Journal (1993): 140. If you wish to borrow copies of library items, please contact your local library. The Rakow Research Library will lend designated books from its collection and will send copies of articles requested by other libraries. Your library can request items through the OCLC WorldShare Interlibrary Loan (ILL) system or by direct request through email at ill@cmog.org. For more information, please see our ILL policies and procedures. We have general histories of the studio glass movement that might be of interest as well. Who were the key female glass artists in the earliest days of the studio glass movement (in the US and internationally)?